“The award-winning Swamp Juice dazzles and entertains audiences of all ages. A story for children yet made with stagecraft for all, the puppeteering in this gloriously silly but astonishingly fun show is incomparable; the 3D sequence, in particular, must be seen to be believed.”—Broadway Baby, 2012. 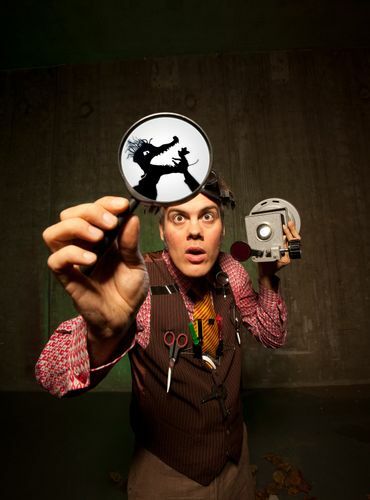 An original and delightful tale of greed, retribution and redemption, acclaimed Canadian performer Jeff Achtem presents a gurgling adventure about life in a swamp, ingeniously told through intricate and awe-inspiring shadow puppetry. Witness Jeff bring his marsh characters to life with the help of delightfully simple props made from household junk. Experience a surreal world of bickering snails, opera singing mice and swamp monsters that leap out from the screen in an EYE-POPPING 3D finale! Recommended for audiences aged 7 and above.